Why do these “deadly sissies” seem so threatening and perversely lethal to movie audiences? Is it because these “deadly sissies,” these brooding, sinister “fags” that insidiously pop up in films every once in awhile are inherently evil? Is that why Hollywood put them in films—especially during the homophobic Forties, Fifties and Sixties to the audience’s skin crawl especially if the audience was a bunch of typically hetero str8t moviegoers? These what I call “Fag Noir” male femme fatales seem to me to be so much more evil, suave and tres sophisticated—than the usual retinue of nefarious Hollywood heterosexual murderers and criminals typically portrayed in classic film noir films. Or is it just my gay imagination playing tricks on me again? Is there a possible hidden gay genre-within-a-genre called ”fag noir”? Fag-noir. A genre which perverts and queers the “normal” run-of-the-mill traditional Heteronormative antihero-narrative so pervasive in the usual Raymond Chandler, Mickey Spillane way of representing crime melodrama fiction? Is fag noir a new genre or has it always been around—submerged, hidden, subversive and sexually transgressive? Is it perhaps because most str8ts have been trained, acculturated, queered into always despising, sneering , even fearing fags—especially sneaky, bitchy, conniving “deadly sissies” like Bruno Anthony (Robert Walker) in “Strangers On a Train”? What about Farley Granger and John Dall in “Rope”—aren’t these killer sissy types simply the worst? Popping up like evil blips on the gaydar screens of all decent law-abiding DOMA DADT antigay Americans? In many ways Martin Landau in “North by Northwest” perhaps portrays one of the most petulant evil deadly sissy villains of all—playing James Mason’s ever vigilant, always close by his side, suspicious personal secretary, Leonard. This remark has to do with Mason’s attractive female companion, Eva Marie Saint. With Landau playing the sissy spy simply seething with green homosexual jealousy. 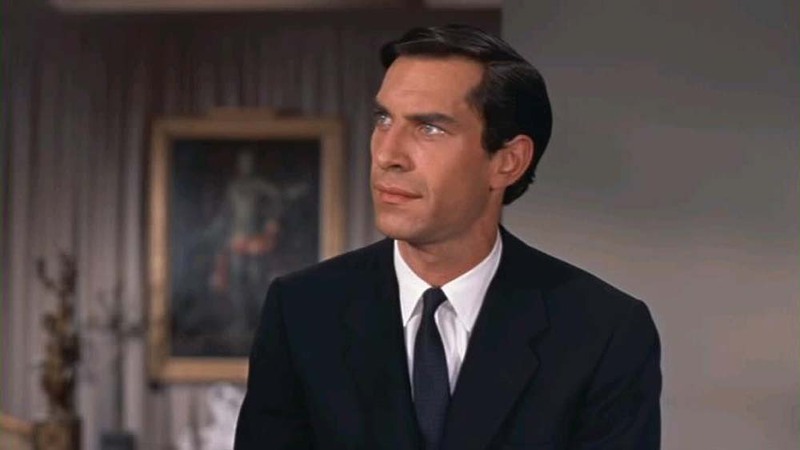 Martin Landau is not only Mason’s personal secretary and right-hand man, he’s also Mason’s male lover. Landau is like a snake—constantly slithering around in the nefarious background of “North by Northwest” masterminding all the dirty work. Like getting Cary Grant totally intoxicated—enough to drive off a cliff in a Mercedes convertible to his death. Landau is competing with Eva Marie Saint for James Mason’s attention—Mason and Landau appearing as a gay couple in almost every scene. They’re both spy accomplices in the espionage racket—around them much of the action of the movie revolves. Then toward the end of the movie, Landau grinds his heel down on Cary Grant’s fingers and wrist as he and Eva Marie Saint cling to Washington’s nose on the steep side of Mt. Rushmore. The look of insidiously evil sissy hatred writhing on Landau’s face captures the fag noir male femme fatale perfectly—before he himself is shot and falls over the edge into the abyss far down below instead. It’s interesting how deadly Sissyhood—picks and chooses the Fag noir male actors it wants who get to play the nefarious role of such sinister sisterhood. For example, Cary Grant and Montgomery Cliff both turned down the roles of teacher and student in Hitchcock’s “Rope”—it wasn’t good for their so-called Str8t Hollywood image they thought. Does the role of evil sissy as the epitome of fag noir male femme fatales still exist in Hollywood’s movies today? 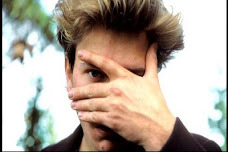 Or was such a role of evil sissyhood just a function of the gay clandestine life style of the time—hidden in the closet and censored by the Legion of Decency and the Moral Majority from the great Silver Screen? 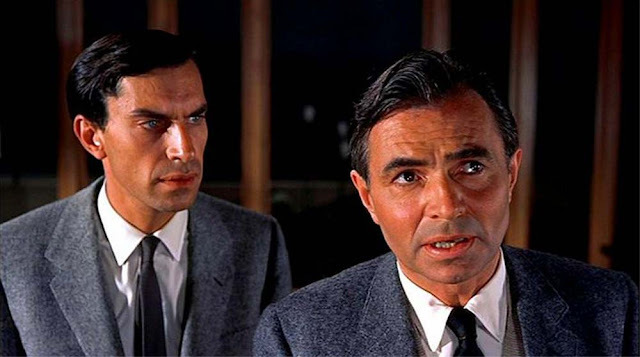 Does the James Mason-Martin Landau gay relationship in “North by Northwest” represent gay relations today—or was this so-called evil sissyhood Mason-Landau relationship just a function of the repressed, homophobic times back in 1959?